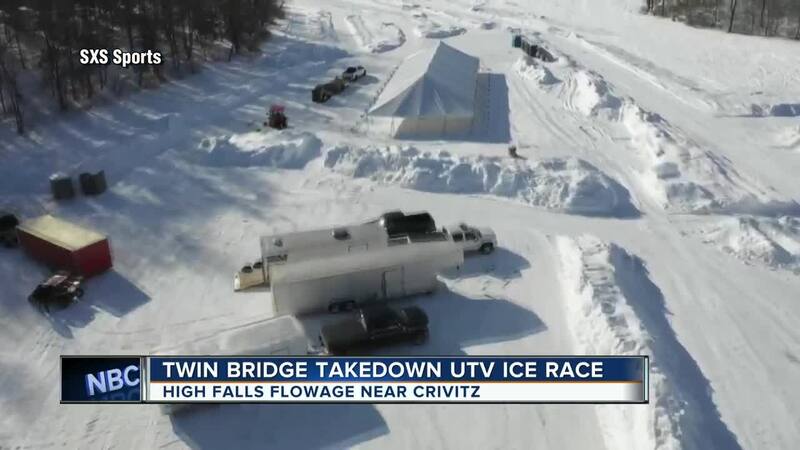 UTV drivers will take to the ice this weekend for the Twin Bridge Takedown in Northeast Wisconsin. The ice race is the first race in the Chasing the Triple Series by SXS Sports , where drivers are taking on the different elements for a chance at paying prizes exceeding $150,000. Saturday's race will go down on the High Falls Flowage about 10 miles outside of Crivitz. "When you're strapped into one of those things you have a 5 point harness and you're in a specific race built seat so you're strapped in there like you're ready to go to the moon," said CJ Greaves, race director and series owner. "You're lined up with maybe 20 competitors next to you and when that green flag drops everyone is taking off at the same time." "We don't just want to put on an event for the racers. We want to put on an event for their families, friends and anyone in the community who wants to come as well," said Courtney Prost, series director. "We have a bounce house, coloring contests, a poker run that's coming up. There is literally something for everyone." Opening ceremonies begin Saturday, March 2nd at 1 p.m. The second race in the Triple Series will take place in Shawano on May 18th and 19th. Drivers will close out the triple round of races in Texas on October 5th.